© 2013 by Michelle Rebecca; all rights reserved; content may not be copied, rewritten, or republished without written permission. Choosing flooring is an important decision that can affect the entire look and feel of your home. Despite the fact that todays market offers limitless choices in materials, vinyl flooring has gained popularity because of its versatile attributes, improved durability, and affordability. Vinyl is a subset of the resilient flooring category. 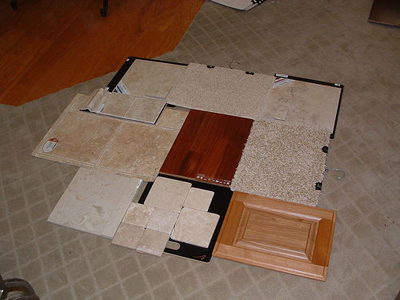 Others in this category include linoleum, rubber, and cork flooring. When choosing your material, keep in mind that you can choose between sheet goods and individual tiles. If you have zeroed in on vinyl for the floors in your home, its extremely important to recognize the differences in the various products on the market and the value they really represent. First, use your senses. Having the right flooring can do everything from increase the value of your home to lower costs associated with heating services. In comparing products side-by-side, you should be able to differentiate which is better. After you handle the samples in the store, check the price tags to confirm your initial impressions. You should also keep a close eye out for the deal that is too good to be true. When it comes to building materials, the cheapest product is rarely the best. Even the best products can lose their value if the installation is poor. Find local reviews on flooring contractors at Angies List. What you are looking for first and foremost in a floor producer is a well-earned, positive reputation. These are companies that have been making vinyl floors for generations, stand firmly behind their products with warranties, and offer excellent customer service. That said, dont discount new or lesser-known labels just because they havent shown up on your radar before. If you find flooring you like from a manufacturer you arent sure about, take the time to research the company, and read reviews and consumer reports to help make an assessment. In order to stand up to heavy use in kitchens, corridors, and main rooms, quality flooring must be thick and feature a durable wear layer thats often made of urethane. Lesser products can be identified easily when they are thinner in comparison and lack the wear layer quality you need. Selection and availability can also be a telling sign, so if the flooring only comes in certain patterns or has a limited stock, it could be a sign you are dealing with an inferior product. The beauty of vinyl flooring is that it offers myriad options in terms of quality and versatility of appearance. Theres no doubt that with a reasonable budget you can find a solution you will be happy with for years to come. If you have any concerns with the product you are looking at, walk away until you are completely satisfied. An investment in your home is something too important to take chances with. Thanks to modern manufacturing and a competitive market, homeowners have the option of choosing a quality product like vinyl flooring to save money while delivering style and durability. By taking the time to inspect the quality, research the product and its manufacturer, and shopping for the right price, you can be sure you will be happy with the appearance and performance of the floors in your home. Michelle is an aspiring writer with a passion for blogging. She enjoys writing about a vast variety of topics and loves that blogging gives her the opportunity to publicly voice her thoughts and share advice with an unlimited audience. Website © 2013 KSmith Media, LLC All rights reserved; content may not be copied, rewritten, or republished without written permission.